British/Arthurian Legend Lore in CU? I've just created a knight-themed character named Breton, and now I'm collecting info to write his bio. 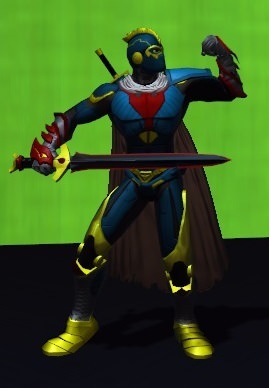 @bulgarex is there any specific lore related to British/Arthurian Legend in the Champions Universe? What are the possible origins for a hero into this theme? Per the setting's official timeline in Champions Universe, Arthur ruled England from Camelot from 490-540 AD. Every reference to that era in Champions books implies that its history played out more or less as the legends say, anachronisms and all. There is, however, one Champions-specific exception. One of the greatest enemies of the knights of the Round Table was the black-hearted French knight, Giles de Morphant, the Knight of the Crow, also known as the Black Paladin. Armed with potent magic weapons and devoted to wickedness and spreading suffering, the Black Paladin dueled Arthur's champion Lancelot and nearly killed him, but was ultimately mortally wounded by the great hero. The Paladin's lover, the witch Chantal, cast a spell to place de Morphant into an enchanted sleep during which his wounds would heal, and secreted his body in a hidden tomb. In 1993 that tomb was discovered by an archaeologist named John Black, awakening de Morphant, who killed him. The Knight of the Crow assumed John Black's identity and renewed his crusade against all that's good and holy. The Black Paladin's full history and description appear in Champions Villains Vol. 3: Solo Villains. He and Chantal are also principal players in an excellent PnP Champions multi-session adventure module, Shades Of Black. There are a couple of other lore references to places mentioned in Arthurian legend; but their connections to Champions Camelot are peripheral at best, and IMO don't provide enough details to use in this context. I was watching this response closely as I have been thinking of adding some Arthurian flair into Britannia's background. Now that's a nice costume!